Feniosky Peña-MoraFeniosky Peña-Mora, associate provost at the University of Illinois, where he also was the Edward William and Jane Marr Gutgsell Endowed Professor in the civil and environmental engineering department, will become the new dean of the Fu Foundation School of Engineering and Applied Science (SEAS), effective July 15. Peña-Mora, a native of the Dominican Republic, has earned an international reputation for his scholarship, teaching, research and engineering innovations as well as his hands-on leadership in managing major university engineering programs at MIT and Illinois. Peña-Mora comes to Columbia after six years at Illinois, where he also was a center affiliate at the National Center for Supercomputing Applications and a faculty affiliate at the Beckman Institute for Advanced Science and Technology. 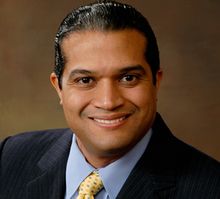 Before coming to Illinois in 2003, Peña-Mora was an assistant professor and associate professor of information technology and project management in civil and environmental engineering at MIT, where he earned his master’s and doctorate in civil engineering. He is a graduate of Universidad Nacional Pedro Henríquez Ureña in Santo Domingo, Dominican Republic. Heading SEAS represents a homecoming of sorts for Peña-Mora, who spent part of each year while growing up living with family in Washington Heights. He learned to speak English in his early 20s by attending English-as-a-second-language community programs at Teachers College, Riverside Church and other city organizations. Peña-Mora succeeds interim dean Gerald Navratil, who has held the position for the past two years, since Zvi Galil left to become president of Tel Aviv University. Peña-Mora arrives at a time of change among undergraduate academic leadership, with Michele Moody-Adams succeeding Austin Quigley as Dean of the College and Claude M. Steele succeeding Alan Brinkley as Provost. “Columbia is fortunate to welcome such a remarkable new engineering dean at a time when the school is becoming ever more central to the University’s mission — from its interdisciplinary work with our medical center in the life sciences and our Earth Institute in climate science to its pioneering service-learning curriculum that is a national model for civic engagement between university and community,” said President Lee C. Bollinger. Peña-Mora’s research interests include information technology support for collaboration in preparedness, response and recovery during disasters involving critical physical infrastructures. He also is involved in change management, conflict resolution and processes integration during the design and development of large-scale civil engineering systems. His research has been groundbreaking in the field of construction engineering and management. Peña-Mora is the author of more than 100 publications in refereed journals, conference proceedings, book chapters and textbooks on computer-supported design, computer-supported engineering design and construction, as well as project control and management of large-scale engineering systems. His publication, “Design Rationale for Computer Supported Conflict Mitigation,” received the 1995 award for best paper published in the Journal of Computing in Civil Engineering. He also is the author of the influential 2002 textbook, Introduction to Construction Dispute Resolution. The new dean holds the 1999 National Science Foundation CAREER Award and the White House Presidential Early Career Award for Scientists and Engineers. In 2007, he won the Walter L. Huber Civil Engineering Research Prize of the American Society of Civil Engineers. In 2008, he was recognized with the ASCE Computing in Civil Engineering Award for outstanding achievement and contribution in the use of computers in the practice of civil engineering.